Charles Byrne was one of a number of Irish giants displaying themselves for profit in the 18th and 19th centuries. Using the stage name O'Brien and advertised at well over 8-feet-tall, Byrne was actually 7-feet 7-inches tall — which is still quite impressive. 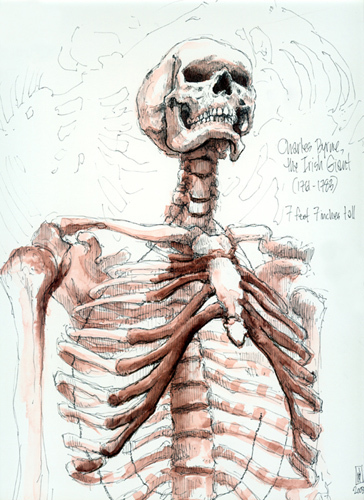 Several anatomists were eager to acquire Byrne's body upon his death. Continued bouts of alcohol-fueled ill health seemed to indicate the wait would be a short one. However, Byrne as a devout Catholic was terrified of allowing the surgeons to cut up his body and went to great lengths to have his body buried at sea. John Hunter (1728-1793), however, managed to acquire the body from the undertaker for a sum of £130, though later stories claimed the sum to be much larger. Although Hunter left behind no theories as to the cause of Byrne's tremendous height, this is now believed to have been due to pituitary gigantism. A tumor on Byrne's pituitary gland would have caused excessive production of growth hormone and delayed the onset of puberty. The skeleton is now one of the most prized specimens in the collection of the Hunterian Museum at The Royal College of Surgeons of England.